The day I wrote this essay saw a historic event for Seattle, Washington with the closure of one of its major traffic routes. Did I go? No. I spent the better part of the day shuffling my antiquated media husks. I alphabetized DVDs, prepping them to pack while listening to CDs, and decided what to keep and what to donate/sell. It was even a nice day out! Would I trade all these for digital equivalents? No. I learned two valuable things today. Through this process of decisively weeding out movies I don’t care about anymore, I realized the other thing: I am curious about watching many of these movies still! Of course, I won’t repeat my college extracurricular “film studies” to the degree of wading through myriad boring movies. If I dislike it, there is no reason for me to continue watching or owning it. 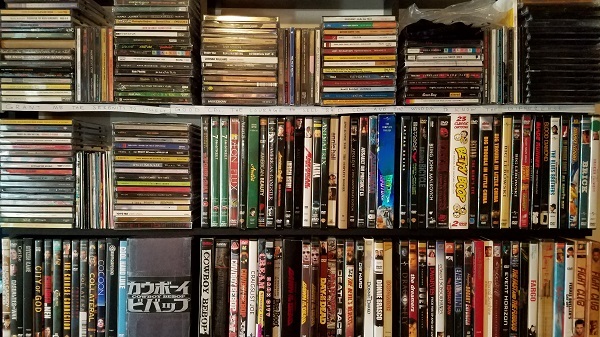 My movie collection, like anything else I own, should be a personal reflection of what I enjoy, rather than just trying to show off. Maybe that was what caused my movie disinterest? I think I’ll plan to watch 12 movies this year instead of 4. There’s a point for materialism! Digital copies of movies, like albums, just lack that certain quality of owning it, looking over the packaging, and feeling inspired to watch it. The only thing is that rather than buying without any hard limit, there should be a sort of collection weeding cycle. My thought process for my CDs is: I’ll go through my collection on an A to Z basis, constantly rotating in the next letter’s worth of music. Constantly asking: Do I still like this? For my movie collection, it will be a little different with only 12 slots per year. I’ll start with “high priority” movies first. Those movies will include ones that I’ve been interested in watching for years but have just never got around to watching. Perhaps those years of anticipation will lead to eventual disappointment? If so, chuck it and move onto the next one. The other “high priority” movies will be the ones I enjoy but because of disorganization, I never got around to rewatching. Then from there, I’ll reassess everything else I own in a “normal priority” mode, partially because, yeah, I own it, but do I really care about it? If not, trade it for something else. Just don’t trade out everything! Inspirations: Besides the process of sorting through my DVDs, with this process being a microcosm of my CD collection? Besides regaining a passion again for watching movies? Honestly, seeing my remaining “unheard” CD collection compact so neatly was really inspiring to me, so there’s that, too. Photo: An adapted version of the serenity prayer appears on my shelf: “Grant me the serenity to collect good CDs, the courage to sell bad CDs, and the wisdom to know the difference.” I’d never really been courageous with weeding any of my collections before.